The Book of Micah (Hebrew: ספר מיכה) is one of the books of the Hebrew Bible and the Christian Old Testament, traditionally attributed to Micah the prophet. It presents the oracles of Micah, who was active in the southern Kingdom of Judah during the late eighth century B.C.E. during the ascendancy of the early Assyrian Empire. Micah decried the social injustice of Judah's rulers and its upper class, as well as the corruption of its priests and even some of his fellow prophets. He warned of the impending Assyrian threat, which he saw as the consequence of Judah's sins. The Book of Micah is also notable for its more hopeful passages, portraying God's love and mercy for His people and promising the coming of a righteous king from Bethlehem who would establish a just society and make Judah great among the nations. Scholars debate which portions of the book indeed originate from Micah's time, and which may have been added at a later date. The Book of Micah provided an important contribution in the prophetic tradition of ethical monotheism and the Judeo-Christian commitment to social justice. Micah reportedly prophesied during the reigns of the Judean kings Jotham, Ahaz, and Hezekiah, roughly 735–700 B.C.E. He was brought up in the small town of Moreseth (likely Moresheth-Gath in the Philistine plain). The prophet’s name, in its elongated form “Micayahu,” is commonly translated “Who is like God?” or possibly, "He who is like God." The quality of his prophecy has led many scholars to the conclusion that he received a good education and may have been one of the wealthier members of the community. Regardless of his background, he was well aware of the avarice and injustices of the rich. The book's prologue indicates that Micah prophesied during the reigns of Jotham (742–735 B.C.E. ), Ahaz (735–715 B.C.E. ), and Hezekiah (715–687 B.C.E. ), a maximum period of 55 years, However, it is not likely that he was active during all of that time. Together with Amos, Hosea, and Isaiah, he was among the earliest of the literary prophets—those whose messages were recorded in some length, as books bearing their names, rather than as brief passage included in longer histories such as the books of Samuel and Kings. Historically, King Jotham was able build on the success of his father Uzziah and maintained a considerably prosperous reign. Tiglath-Pileser III of Assyria, meanwhile, increased considerably in power, thriving long into the reign of Jotham's son Ahaz. Facing an invasion from the combined forces of Israel and Syria, King Ahaz became Tiglath-Pileser's vassal. 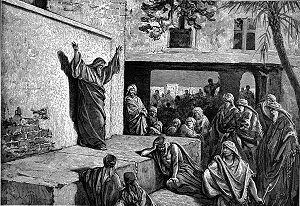 After visiting the Assyrian king in Damascus, Ahaz remodeled the Temple of Jerusalem after the pattern of the Temple of Asshur in Damascus and was accused by the prophets of tolerating idolatry. His son Hezekiah came into power around 716, rebelled against Assyria (2 Kings 18), and instituted a strict Yahwistic religious reform. The Book of Jeremiah indicates that Micah may have risked his life in prophesying at the beginning of Hezekiah's reign, but that his prophecies were heeded. Conservative biblical scholars attribute virtually the entire Book of Micah to his authorship. However, critical scholars attribute much of the material to others. It is generally agreed that Micah composed chapters 1 through 3. Chapters 3-5 are rejected by critical scholars primarily because they foretell specific events in the sixth century B.C.E. long after Micah's death. Chapters 6-7 contain elements of a universalistic religious outlook which was not widely present in Judaism until well after Micah's day and are thus rejected by some while accepted by others. Some of these passages are repeated verbatim in the Book of Isaiah. It is difficult to know which borrows from which. In any case, critical scholars tend to view such passages as originating in exilic times, whose viewpoint they reflect. Chapters 1–3 mainly consist of oracles of judgment. Judgment in Micah is seen in the destruction of Samaria—the capital of the northern kingdom of Israel—in the coming of an invader (probably Assyria) against Jerusalem, in the loss of the land of the greedy, in their being abandoned by Yahweh, in Judah's future shame over the false prophets, in the siege of Jerusalem, and the purging of the land from idolatry and war. Micah was particularly aware of the greed of the wealthy, and he speaks boldly against social injustice. He was also a firm opponent of Ahaz' soft policy toward idolatry, believing instead that Yahweh alone must be worshiped by His people. Micah's prophecies provide a dire warning that Judah will face destruction by the Assyrian menace if it does not repent. The Book of Micah—whether written in total by the prophet himself or added to by later writers—also provides a message of hope for redemption and the coming of a new ruler who would make Judah great among the nations. "Is not the Lord among us? No disaster will come upon us." Micah condemned religious practice when it was not combined with ethical performance (3:9–10, 6:3–5, 6–8). The book's middle chapters provide the hope of redemption and the coming of a messianic king. Fervently, yet concisely, it speaks to the issues of the day in terms of the nation's covenant obligations with the God of Israel. The prophetic tradition of social justice lies at the roots of the modern movements for social change based on the Judeo-Christian tradition. The Book of Micah—along with those of Amos, Hosea, Jeremiah and Isaiah—contributed the seminal concepts on which those movements rest. Micah was also one of the first prophets to promise the coming of a righteous king, later known as the Messiah. The tradition of the Messiah's being born specifically in Bethlehem is found nowhere else in the Old Testament except the Book of Micah. Maxey, Al. Minor Prophets: Micah. www.zianet.com. Retrieved August 22, 2007. Wood, Joyce Rilett. Catholic Biblical Quarterly, 2000. Speech and action in Micah’s prophecy. Retrieved August 22, 2007. Michah - Micah (Judaica Press) – translation with Rashi's commentary. www.chabad.org. Online Bible – (ESV, KJV, Darby, American Standard Version, Bible in Basic English). www.gospelhall.org. BibleGateway.com – (New International Version). www.biblegateway.com. History of "Micah, Book of"
This page was last modified on 20 September 2018, at 14:59.